Fridayyyyyyyyyy! Sorry for posting so late into the afternoon but I had some things to take care of this morning. What's more important though is that you have something to get you through the rest of the day. Appropriately enough, seeing that it's Friday, I bring to you something called "The Fun Theory." We posted about their last project which involved making recycling fun, and the other was encouraging people to take the stairs rather than the escalator. Well the newest fun theory project is called "The Speed Camera Lottery." Kevin Richardson, the creator, came up with an idea which uses speed cameras at intersections and rewarding those people who obey the speed limit but at the same time punishes those who don't obey the speed limit. 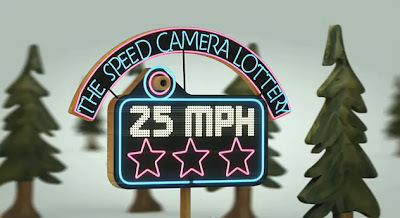 From what I understand, people who obey the speed limit get entered into a lottery where they have a chance at winning the fees that were racked up by the people who didn't obey the speed limit. A great idea in my opinion, and what better way to make people obey speed limits when they know there is something in it for them! Anyways, I hope you enjoy, and would love to hear what you have to say in the comments section! Something else I wanted to pass on before I shut down for the weekend, is that on December 8th, there is a free webinar titled "Capitalizing on Social Media to Drive an Effective Product Launch" I'm hoping to attend, and if you get a chance, maybe we could compare some of our thoughts from the webinar. It should be pretty interesting though. The webinar looks to tell us how Microsoft's marketing function leveraged social media to engage brand enthusiasts to support the launch of Windows 7. Anyways if you are interested, you can register for it here. Hope everyone has a great weekend and APL and I hope to bring you some great posts next week!